Kaileena Suza has compiled an interesting set of images of planned and existing architectural pieces in China. While not all the efforts are successful from an aesthetic point of view, there are a few that are quite striking, at least in the artist's rendition. 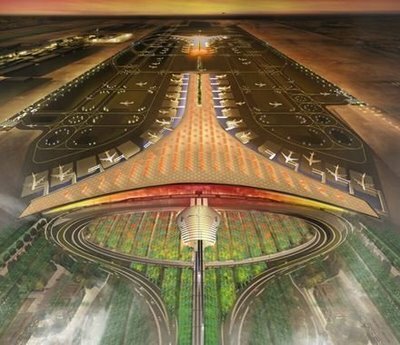 Above is the planned Beijing International Airport scheduled for completion in 2007. I guess they're going for an eco-friendly look with all that greenery.